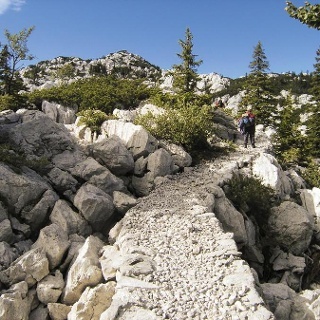 In the area from Tršće to Risnjak National Park, Via Dinarica follows the route of Gorski Kotar Hiking Trail. The trail is well kept and maintained. 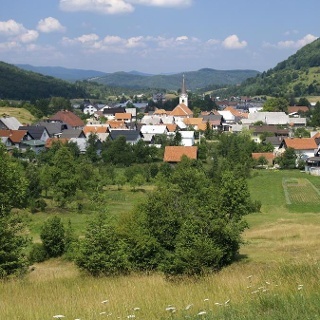 From Tršće, we first need to climb to the village of Kraljev Vrh by road. From there, we then continue by following the hiking trail markings towards the south and towards the hill of Sveta gora with a church. From Sveta gora onwards, the route takes us very steeply through the forest, as we descend towards the canyon of the Kupa River. This is the source area of the Kupa River, with hiking trail markings taking us straight to the river source. The source of the Kupa is extraordinarily attractive, since the river springs from a clear lake and immediately flows as a large river. From the source of the Kupa River, the route ascends to the village of Razloge. From there, we need to take the forest road (to the right) towards Crni Lug. 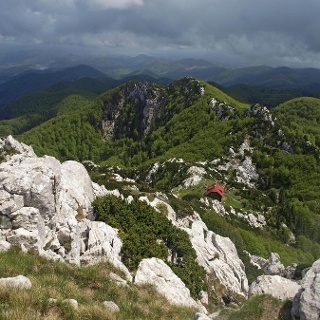 Mountain landscapes in the area of Crni Lug are remarkably beautiful and attractive. Great place to camp at 2nd house you see entering Hrib Southbound. Bar, restaurant, tiny cabins, beautiful spot with views and great hosts. Trail is really bad at the 2 spots others mentioned. Really needs someone with a chainsaw to go through there. Apparently an ice storm from 3 years ago has caused this problem. Monday, July 10, 2017 6:08:03 Am bushwack from hell.